Next: Next post: Love Train available today for free on Amazon.com! Rodney Page first published a book in 2005, and seven years later has learned just how much the industry has changed. Learn about the hybrid indie publisher he went with and which vendors he chooses for his marketing efforts. 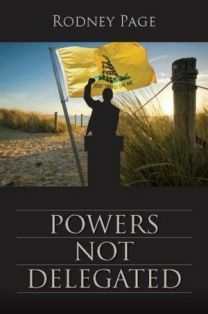 Powers Not Delegated is a fast-moving political thriller set in current times. The reader will recognize many national challenges and circumstances in the book; they are based on reality. And, though fiction, the book highlights the type of leadership and policies we, as a country, must embrace to effectively overcome those challenges. The characters are vivid representations of the best and worst we have in our political system today. Honestly, I first tried the traditional route for Powers Not Delegated, but soon learned the publishing landscape had changed dramatically since 2005 when my business book was published. I was determined to get the book published, thought it was pretty good and that a large market existed for the genre and theme. I researched the various self-publishing models, paying close attention not only to the relative costs, but the processes themselves; what I could do myself and what I would have to contract. When it was all said and done, and I assessed my skills, I settled on a hybrid indie publisher. Yes, I wrote a non-fiction business book in 2005 and went the traditional route: an agent and a mainstream publishing house. I was fortunate to network to a great agent, and in those days, a non-fiction author could break through if the subject matter was ‘hot’ at the time. My book addressed the challenges faced by companies in a high growth environment, a lot different environment than today. I’ve enjoyed it, no big surprises. I asked a million questions before I signed with the publisher. And they were very open and honest about what our respective roles would be. Everything that’s transpired so far has been as expected. My publisher, BQB Publishing, frankly, has been delightful to work with. Since the book doesn’t come out until October 30, all my thoughts are speculative. However, I will share those activities I believe will prove effective. Related to the publisher’s marketing activities, ask questions and find out what they will do, and offer suggestions. As an example, in my case, I learned the publisher’s distribution network didn’t address PX stores on military bases. Once I inquired, the publisher moved quickly to close the distribution gap. Personally, I’ve spent countless hours on the internet identifying organizations, blogs, influencers, even individual potential buyers in my target markets for marketing communications. Additionally, I developed a blog targeting my target audience. A website is a requisite, and, of course, the social media. I focus on Facebook and Twitter. And I suggest authors diligently seek reviews and interviews. Again, at this point, this is an opinion more than based on real experience. I’m not spending a great deal of energy on scheduling book signings. Everyone says I need to do them, but I view signings as tremendously time-consuming and expensive for the value received. I’ll do some signings and see what happens, but think my time might be better spent working on other marketing activities. First, I found GoDaddy’s website and blog offerings very cost-effective, and their templates for creating the site and blog are fairly easy to use. And if you utilize email marketing, GroupMail is also cost-effective and easy to use. The importance of a good editor! Fortunately, my draft was pretty good in terms of plot lines, plausibility and general organization. But I learned so much about the nuances of word crafting. There’s no substitute for an experienced editor who’ll take the time to understand what you are trying to accomplish with your book. Also, find an editor you can easily work with; stow your writer’s ego and learn from open give and take. Have a better prepared draft of the next book when I begin the pre-publication process. Having been through the editing process, I believe I can cut a week or two off, getting the book more quickly to market. First, if an author is not familiar with the fundamentals of marketing, I suggest he/she find a crash course in ‘Marketing 101.’ Fortunately, I have over forty years of business experience, much of it in marketing and sales. I understood the concepts of target marketing, channel analysis, features vs. benefits, etc. Until authors understand the philosophy of marketing, they will be confused and overwhelmed with the tactics: everything from developing the ‘elevator speech’, to developing a blog, to the messaging on their websites. And, I might add, after meeting and talking to authors in writing and author groups, many of them have the “If I write it, they will come” approach to potential readers; that a well-written book will sell itself. It just ain’t going to happen. Powers Not Delegated is the first of a trilogy. By the People, For the People, the second book, will probably be released in 12-14 months; I’ve finished a pretty complete draft, and it should go into pre-production around the first of the year. Also, I’m toying with a Civil War time travel theme, a completely different type book than the trilogy. They can go to my website, powersnotdelegated.com or BQB Publishing, bqbpublishing.com.